and Eric Wynalda made their coaching debuts for their new teams in preseason on Saturday, and their teams both came away with lopsided wins. De Boer's Atlanta United, the 2018 MLS champion, crushed the Seattle Sounders, 7-1, in a game that stretched over four 30-minute periods at Cal State Fullerton's Titan Stadium. 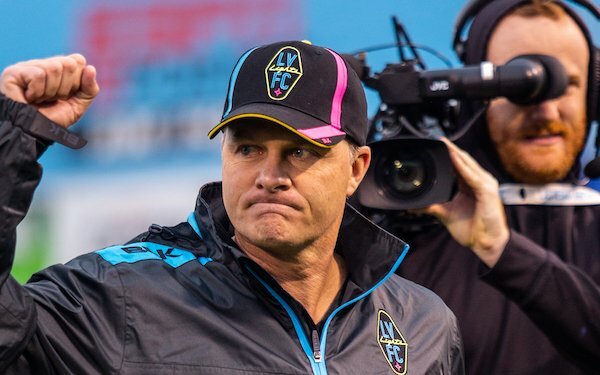 Wynalda's Las Vegas Lights, who will be playing their second season in the USL Championship, pounded 2017 MLS champion Toronto FC in front of a crowd of 5,232 fans at Cashman Field. Josef Martinez, the 2018 MLS MVP and leading scorer, Dion Pereira and Romario Williams each scored two goals for Atlanta. Gonzalo "Pity" Martinez scored in his debut for the Five Stripes from the penalty spot. Atlanta United starting XI -- Guzan, Parkhurst, Gonzalez Pirez, Robinson, Gressel, Bello, G.Martinez, Remedi, Asiedu; Barco, J.Martinez. Seattle Sounders starting XI -- Frei, Leerdam, Marshall, Campbell, Hinds, Svensson, Leyva, Bwana, Rodriguez, A.Gonzalez, Ruidiaz. The lone Sounders' goal came in the 88th minute from 16-year-old Ray Serrano, one of many teenagers from the Sounders' second team, Tacoma Defiance, who played. Alfonso Ocampo-Chavez, another 16-year-old, was denied a goal when a shot stopped in a puddle caused by heavy rains that swept Southern California. Togolese Alex Harlley, Emmanuel Adebayor's nephew, and Irvin Parra, who began his career in Germany's lower divisions, staked the Lights to a 2-0 lead before Toronto FC cut the lead in half in the 64th minute with a Ryan Telfer strike. The Lights' subs put the game away, though, as Edwin Rivas, who once played for Toronto FC II, scored twice and Bryan Arguez, the former U.S. U-20, added a goal. “Fall in love with these guys, "said Wynalda, "because they’re worth it. We knew that as a coaching staff coming in, our job is to put them in spots where they can succeed and let them showcase their talents, we saw a lot of that tonight."